Imported galloper Mister Impatience has plenty of stamina and he showed that at Ballarat on Sunday - the five-year-old proving a class above his rivals in one of Victoria's rare provincial staying tests. Lining up over 3000m in the Hygain Handicap, the son of French Derby winner Hernando had to do a bit of early work from his wide gate but once settled into fourth position by apprentice Anthony Boyd he travelled nicely. And he had plenty of petrol in the tank when the pace stepped up from the 800m, Mister Impatience chasing the leader to the turn before hitting the lead early in the straight and racing away. As his rivals tired Mister Impatience was strong to the line, his winning margin a soft and impressive seven lengths. 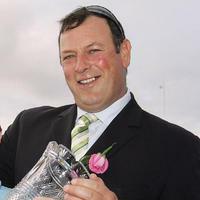 "He had been good at his previous start over 2400m at Mornington but we made a bit of a mistake there," Michael Moroney said. "We thought he'd be suited settling back but the race ended up being run very slowly so he just couldn't make up the ground - but he was only beaten just over three lengths." "This time we decided to make a more positive move and it worked out well. He was fitter for the longer trip and away he went!" A 2500m contest in Sydney beckons for Mister Impatience, that race to be a test to see how he fares the opposite way of going in preparation for the two mile Queensland Cup. A two times winner in the UK - and second to subsequent Epsom Derby winner Ruler Of The World in the Gr.3 Chester Vase - Mister Impatience was purchased by Paul Moroney at the 2013 Tattersall's Autumn Horses In Training Sale. "He had a busy 12- start three-year-old campaign in England and was also fourth at Royal Ascot in the two mile Queens Vase behind Leading Light who went on to with the St Leger and the Ascot Gold Cup." "Clearly he has been crying out for long distance races and should continue to be a force to be reckoned with over staying trips." A son of the Listed winner Katy Nowaitee, Mister Impatience is a half-brother to the US Gr.3 winner Tottie from the immediate family of Gr.1 Yorkshire Oaks winners Sally Brown and Untold. A descendant of the influential matriarch Simon's Shoes, Mister Impatience hails from one of the world's great families - that of Sadler's Wells, Nureyev, Fairy King and Thatching.